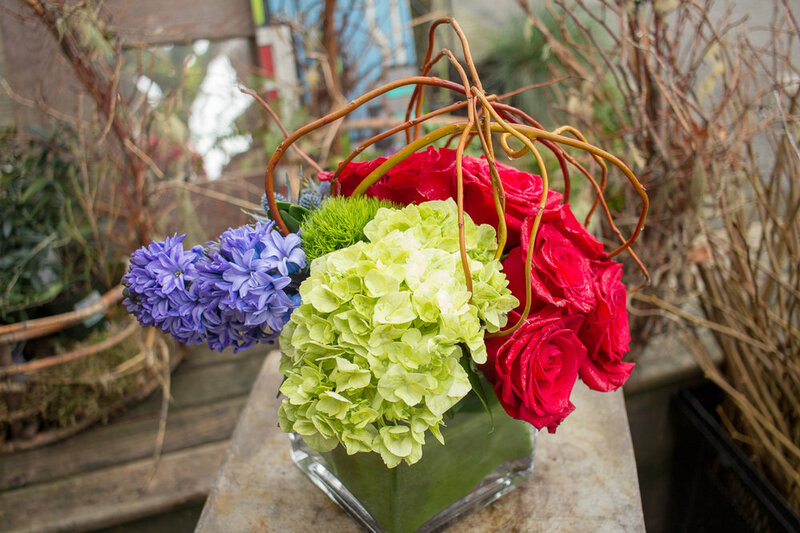 Signature Arrangements are created in a clear glass vase perfect for tabletops and seating areas. The interior of the vase is wrapped with a ti leaf for a clean modern look, and the fresh blooms are accented with twisting willow. Choose a rose color when you order and we will coordinate the accompanying flowers to perfection! Please note that we reserve the right to make substitutions of equal or greater retail value due to product availability, quality, or season. Celebrate your love's past, present, and future with this arrangement featuring three premium roses. Beautiful seasonal blooms are crowned with an elegant arc of twisting willow. Give your true love a premium rose for every day of the week. Arranged with fragrant hyacinth, seasonal blooms and crowned with twisting willow, this gorgeous arrangement is available in your choice of color palettes. This stunning arrangement bursts with gorgeous floral blooms and one dozen premium roses. The twisting willow branches and fragrant hyacinth bulbs can be planted in the garden so your thoughtful gesture is truly everlasting. Our rose bouquets feature premium long-stem roses direct from the grower. Wrapped with greens in designer paper and satin ribbon, a bouquet of roses is a time-honored way to show your Valentine how much they mean to you. Available in your choice of colors, these roses have larger blooms and last longer than those you'll find in the grocery store. The chilly, rainy month of February is the perfect time to send Valentine’s Day flowers to your sweetheart! Flowers on 15th creates exquisite flower bouquets and floral arrangements to showcase your love. 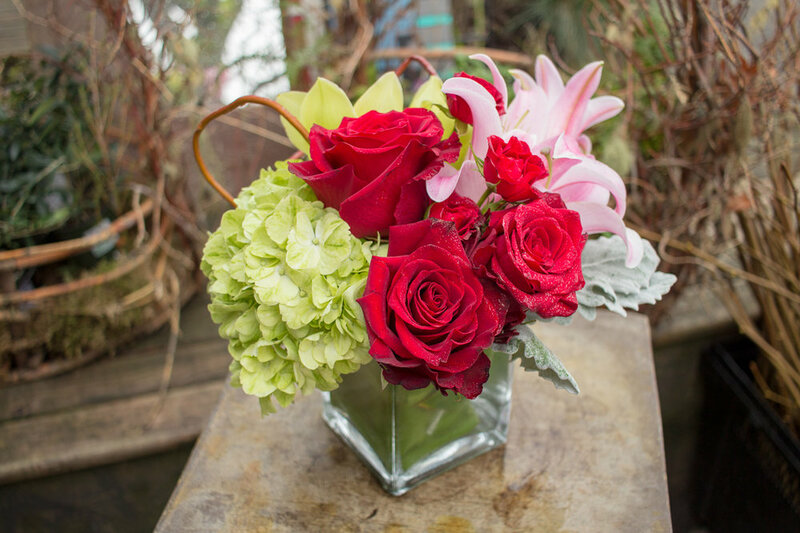 From classic Valentine’s Day roses to more modern arrangements with orchids and lilies, our skilled Seattle florists will design a gift of nature’s beauty that complements the beauty of your special Valentine. Valentine's Day is Wednesday, February 14th, 2018! Save yourself the stress of waiting to the last minute and order your floral gift to be ready when you are. Of course, we also offer fresh flower delivery so you can rest assured your Valentine knows you care. Call us direct at (206) 324-ROSE (7673) to send Valentine’s Day flowers or discuss our selection of flowers for Valentine’s Day.